Claire Quinn brings the ball up the field. The defender, her sophomore teammates and the Wildcats are seeking a win Thursday at Ohio State. Of the four players to start all 12 games for Northwestern this season, three are sophomores. That’s an impressive statistic sophomore midfielder Nell Copeland was at first shy to brag about. Copeland opened up a bit more later. “My class rocks,” she said, laughing. As an up-and-down season for the No. 16 Wildcats (6-6, 2-0 Big Ten) continues Thursday at Ohio State (6-8, 0-3), the team’s surprising reliance on its sophomores has become increasingly evident. Goaltender Mallory Weisse ranks third in the Big Ten in saves per game. Attacker Liza Elder has six goals in her last six appearances. Even Copeland, who has started every NU game in the midfield this year, scored her first career goal last week against Johns Hopkins. 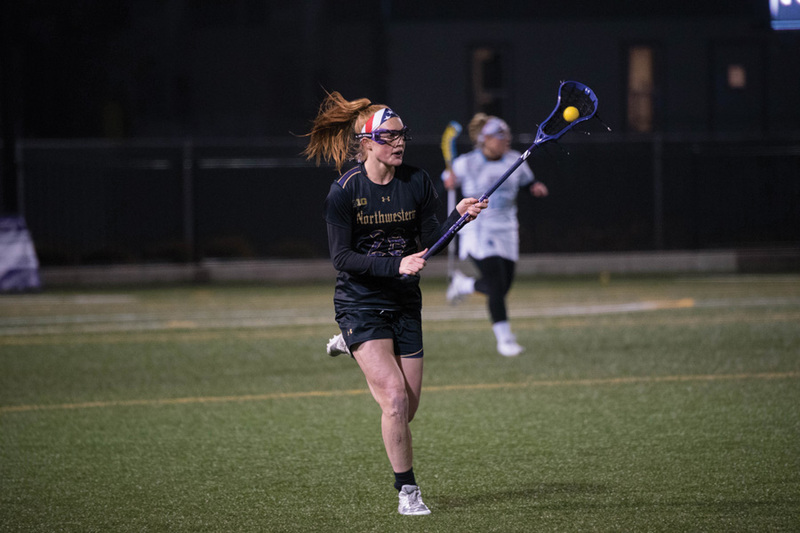 Arguably the biggest standout of the group, however, is defender Claire Quinn, who leads the team with 30 ground ball pick-ups and 21 turnovers caused — no one else, in either category, even comes close. The continued emergence of significant contributors within the sophomore class has proved a boon for a Cats team that is suffering from the continued injury absence of last year’s second-leading scorer Selena Lasota and a recent slow stretch from current second-leading scorer Danita Stroup. NU will certainly need production to come from somewhere as it begins a conference-heavy stretch to conclude the regular season. Four of its last five games are against Big Ten foes. Quinn, who started as a freshman in last year’s meeting with Ohio State, promised that her sophomore class — as always — will step up.